This model works with the pins displayed vertically so that nothing obstructs your view when you aim at your target. The React technology in place creates mathematical precision that you will take significant advantage of when out in the field. Corrections and adjustments are easy to conduct, as the bow sight comes equipped with all the needed features to customize your experience when using it. You will only find this model available in the right-hand configuration, so, if you are a left-handed bow hunter, that will certainly not make you too endearing toward the manufacturer, seeing that no option is provided for those who do not use their right hand as the predominant one. – Multi-pin models are highly appreciated for the extra accuracy usually offered, and this model is no exception to the rule. What makes this model stand out from the competition is that it comes along with something called Vertical In-Line pin technology. That’s a fancy name for the particular placement of the five pins available that is not horizontal like it is the case in the vast majority of such bow sights available on the market. That can give you an excellent advantage, as it will not obstruct part of your view. Especially when you intend to shoot targets that are at long distances from your position, and they appear quite small through your sight, you will need every fraction of an inch of visible space to land a secure shot. – Another thing that many bowhunters find above average in this model is the full range of adjustments possible. To start with the obvious, you will like the tool-free micro adjustments in place for windage and elevation. If you need mathematical accuracy, and clear increments, the micro-click operation will surely provide you with the means to maintain your precision, regardless of conditions. 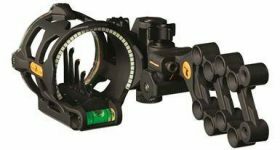 Another adjustment option at your disposal is the dual axis operation that will allow you to keep the same superior accuracy when you’re shooting at targets located at large distances from you. 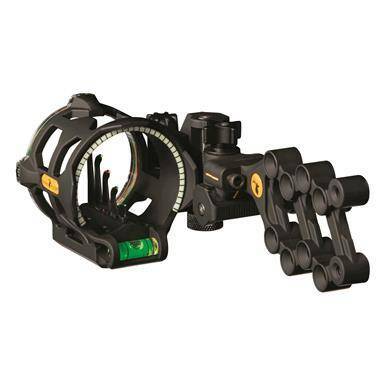 – This bow sight is not affected by vibrations even when you shoot, and that is something that must be talked about. The Ballistix CoPolymer system provides good encasing for the optics so that your visibility will not become affected by the natural vibrations that happen each time you release an arrow from your bow. What is equally impressive, because the body is made of aluminum, the bow sight is lightweight, which means that it will not encumber your weapon with unnecessary weight. – The React pin technology in place is another aspect to address, seeing how much it influences how precise this bow sight is. By adjusting only two pins, the others will fall into place, which eliminates all the extra work with calculating their locations. Even if you may feel a little skeptical, it is a good idea to give it a try, as you might be quite impressed with how well this works. Other users also mention that their disbelief evaporated the first moment they saw how easy the technology works, and how much time can be saved by this alone. Trophy Ridge is a company with a long-standing reputation in making bowhunting gear, and the React V5 is another proof of its dedication to innovation and improvement for this type of equipment. Using a technology that allows the placement of pins in a vertical position, this bow sight provides you with an unobstructed view of the field so that you can quickly observe targets on the move. Also, because it uses a multiple pin configuration and the React technology, it is precise and easy to use, something that you can surely appreciate once you are out in the open and you need to acquire your target. The only thing that left-handed bowhunters won’t like about this model is the fact that it is not sold in the configuration needed for their use. That should be enough reason to knock off at least half a star from the overall evaluation of this product, but, seeing that this reputable company makes other excellent bow sights, you can browse through its lineup for something suitable for your needs.